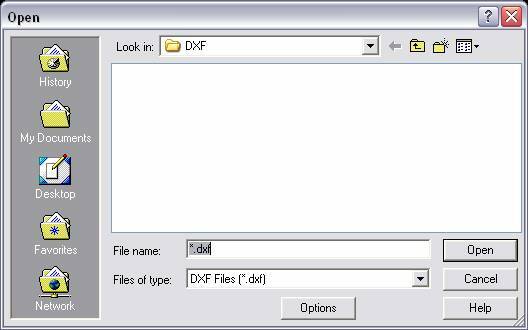 Follow the steps below to import a DXF or DWG file. There are limitations to what entities are and are not supported during translation. Note that AutoCAD external block references are imported as part references. Select AutoCAD DXF or DWG (depending upon what format you are trying to import) from the File>Import submenu. The Open dialog box appears. Select a DXF (or DWG) file to import. Note that the graphic below depicts the Open dialog for DXF import. Select the OPTIONS button to configure the import options. When this button is selected, the Import Options dialog appears.